Beatrix Potter, whose ‘little books’ amazingly still chalk up annual sales of more than two million worldwide, has been honoured on the 150th anniversary of her birth by a Royal Mail stamp issue depicting her best-known characters. I have a suspicion, though, that she would have been just as pleased by this ambitious Everyman Theatre family musical, based on her own favourite story, The Tailor of Gloucester, which somehow missed out on the philatelic tribute. 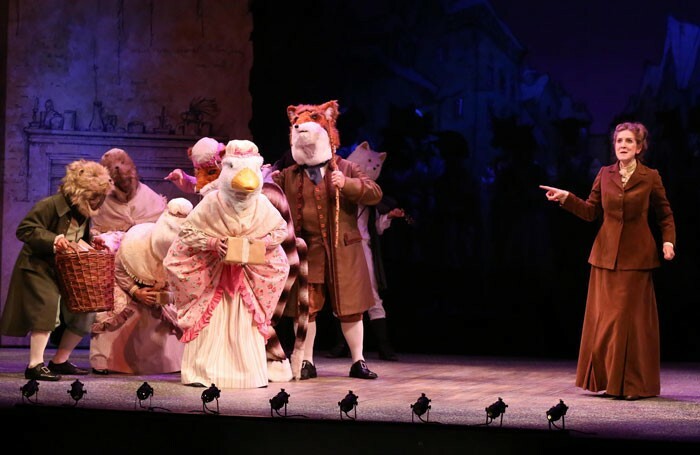 The entire show is very much a community effort, with four professional actors taking the leading roles, augmented by about 40 local singers, dancers and musicians. Everyman creative director Paul Milton has provided additional local flavour by recounting how Potter penned the adventures of the tailor, his cat and assorted mice, at the home of friends in neighbouring Painswick, although this section is less appealing than the tongue-in-cheek telling of the tale itself. The highlight of the evening is the tuneful score by Peter Banks, which allows the community players to showcase their singing and dancing skills, often in authentic Potter-like animal costumes. From the professional acting ranks, Madeleine MacMahon’s Beatrix is just the right side of being too much of a bossy boots, Richard Curnow is a sympathetic figure as the ailing tailor (a rare glimpse from Potter of the darker side of life at the turn of the century), and Craig Rogers and Mark Carey bring true pantomime skills to his cat Simpkin and his VIP customer, the Mayor of Gloucester.